So here we are, post-exorcism, and it appears that angry ancestor Quentin Collins did not, in fact, depart in haste the confines of this house, as per request. 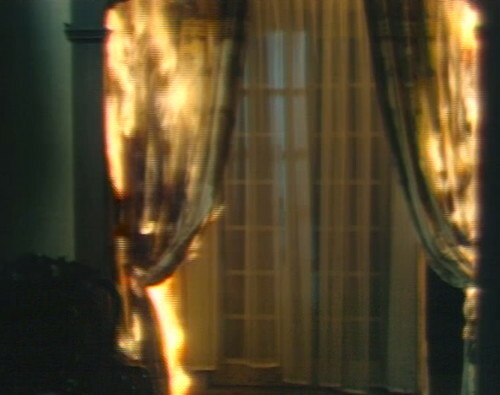 What he did was lurk in a mirror for a while, and then set fire to the curtains. This is how Quentin expresses himself, through the language of property damage. 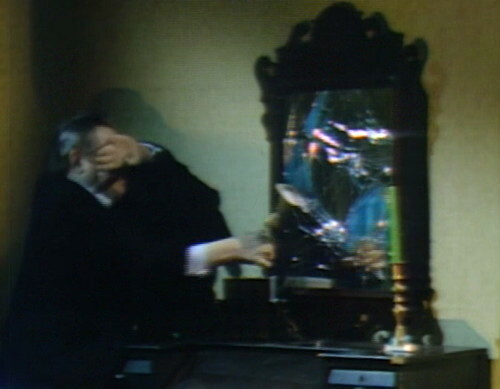 Stokes grabs a nearby candlestick and smashes the mirror, which is the only sensible thing to do. That means another seven years of bad luck, but who would even notice in the Collins family. Just tack it onto the end of their tab. And then here comes Roger, a Scully in search of a Mulder, and he asks just what in the name of heaven has been going on here. Roger: There are no ghosts in this house! Stokes: If I were a ghost, as I assume someday I shall be, I would not let mere words drive me away from my home. Even the words of the exorcism. Roger: I agreed to that because I hoped it would stop my sister’s concern. And I hope you will now stop this aimless eccentricity. Tell her that the ghost has gone! But Roger has to know that’s not going to work. Telling Stokes to stop being aimlessly eccentric is like telling Miley Cyrus to stop sticking her tongue out. It just won’t happen, no matter how often you try. Now, Roger is not actually a born skeptic. In the past, he’s found the idea of ghosts amusing, and he set up the seance that sent Vicki into the past. But the way that he’s barking at everyone today makes him sound more like Joshua, from the 18th century. Louis Edmonds is playing the wrong character. But they’re enacting a specific ritual in today’s episode, and it requires the sacrifice of a skeptic. Today is the day that the Collins family abandons Collinwood, the most significant event we’ve ever seen on the show. They can’t go down without a fight. 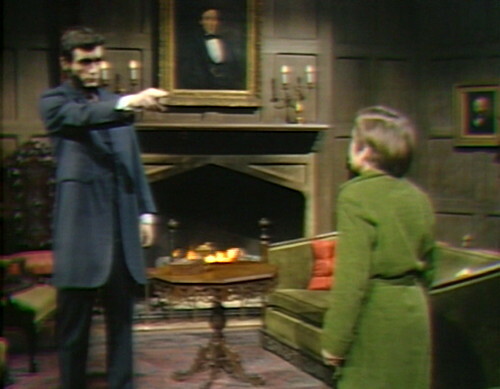 When the show began, the audience may have believed that Dark Shadows was the story of the Collins family, their friends, their servants and their secrets. But then the show traveled back in time for four months, keeping all of the current Collins family members frozen between two ticks of the clock. Everyone in the cast had a different name, and a whole new character to play. The only thing that stayed constant was the house. And over the last few months, we’ve seen Collinwood exerting a magnetic pull on every character on the show. All the characters who lived off-property either died or went to a mental institution, with Maggie, Chris and Amy as the refugees who made it safely onto the estate before the drawbridge closed. Elizabeth died, and then came back from the dead and showed up at the front door. Vicki died, and she signaled for help by appearing in a photograph taken of the front door. 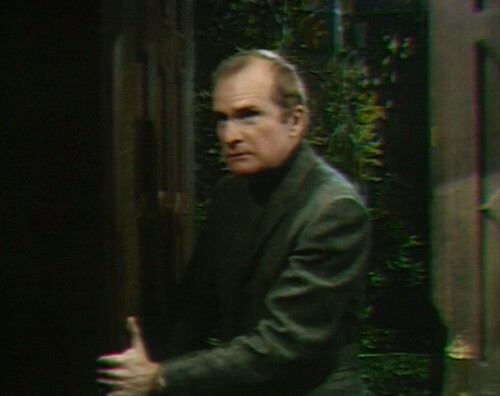 Jeff returned to the 18th century, and just last week, his new incarnation showed up again at the Collinwood front door. Collinwood is a refuge, the only safe place in a world that has literally included an emissary of Satan building an army of the living dead, just down the street. The night has grown darker, and this house is the only source of light. It’s also the only permanent standing set, so if we don’t use it, then it’s kind of a waste of studio space. And now, the house is broken. David and Amy broke the seal on another mystery box hidden in the west wing, and let another dangerous creature loose to grab hold of the show, and shake everyone else off the screen. Quentin appears anywhere he likes now — in the drawing room, outside the Old House, right in front of Roger, or anybody. You can’t hit him, and you can’t shoot at him. You can’t negotiate with him, or scare him, or bully him. He can strangle you with a curtain sash, or give you a heart attack, or send you tumbling down the stairs. The only thing you can do is die, or run away. So that’s what they do. They pack up some suitcases, and they turn out the lights. And for the first time since the late 18th century, the Collins family leaves Collinwood. This is the house where Victoria Winters once lived. This is the house where the scary intruders were Burke Devlin and Jason McGuire. This is the house that Art Wallace built, where Ron Sproat and Malcolm Marmorstein spent their afternoons moving the Collins family around in lazy circles. They’re all gone now. Something new has taken over. Collinwood belongs to the ghosts and the monsters now, to the mad, the cruel, and the aimlessly eccentric. Now it belongs to Sam and Gordon and Violet. Let’s see what they can do with the place. 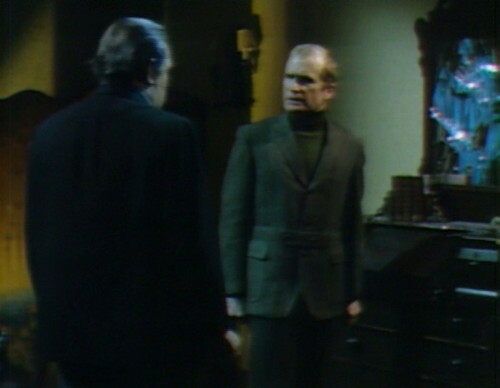 When David dashes from the drawing room through the foyer and out the door, the boom mic can be seen hanging above the foyer. Quentin appearing to Roger in the drawing room. That is a genuinely spine-tingling moment. More so than when he appeared to Mrs. Johnson in the cottage. Even more so than when Maggie saw him in the west wing or in the study. Because Mrs. Johnson is nervous and edgy by nature anyway, and Maggie as we know has that post-hypnotic stress disorder from not being able to recall a significant chunk of the summer of sixty-seven. That shuddering moment when the camera whips to the left to reveal Quentin standing there proud and terrifying and Roger shocked in his tracks is because Roger represents the skeptic in the audience–the sane, rational, disbelieving holdout who in that one instant has just had all his sanity, rationalism, and disbelief destroyed in less than a double-take. So we are truly with Quentin now, we are willing to be scared. We no longer have a choice. Honestly, THE most oh my god episode in the series. Really the final scene with Roger and the empty house is….. somebody give me the word I’m looking for!!!! A good example is the costume party seance at the Old House in 1967. Without Roger, it couldn’t have taken place. 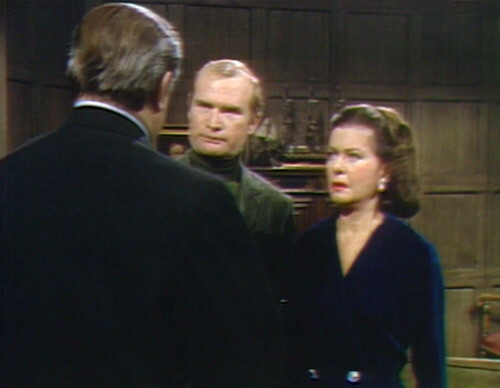 Burke by that point was too stiff and dull to support it, and while Carolyn might lightly suggest it, she didn’t have the force of will to push forward against Barnabas’s clear objections. Later, with the seance that sends Vicki back in time, Elizabeth is the one who wants it to occur, so Roger can then fill the role of “spoiler” (mocking the whole thing). Roger the Goldfish. I’ll accept his sudden scepticism because it leads to the great reveal scene, and his threat as they abandon the house. I wonder what was going through the minds of the young viewers in 1969. Anyone in the cast could have been. Personally, I love Stokes’ casual mention that he fully expects to be a ghost some day. That’s not just an awareness of mortality. That’s our Professor all over. He knows that the dead that need to rest and be watched over by a frightened caretaker are the dull ones, those who have no ambition. For those with powerful wills and personalities (and really, it’s practically the only explanation for Angelique’s return as a ghost), death is no more than a brief inconvenience which you just brush off. I also like the sudden “Oh, of course, no wonder it didn’t work” reaction, and as Danny has pointed out, he just plans to keep on trying. 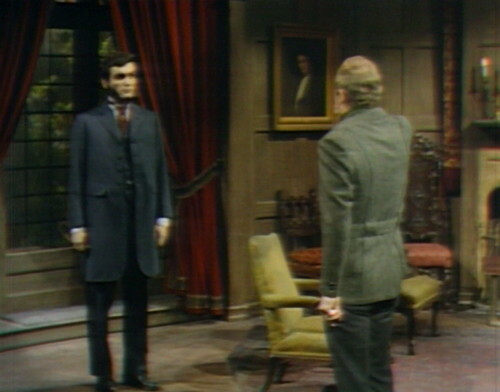 Roger being confronted by Quentin’s ghost is just as satisfying as Julia taking Vicky to see Barnabas in his coffin. My only regret is that Vicky will “never remember” it. By far one of the most haunting and unsettling endings of a DS episode ever filmed: Quentin’s total conquest of Collinwood. This is one of the most complete victories a villain has had on the show so far. The closest we had come so far was Angelique’s curse of “everyone who loves Barnabas will die,” but Joshua’s escape prevented that. The show will never reach this level of depressing and bleak again until the flash-forward to the post-apocalyptic world of 1995. Joshua escaped, as Barnabas intimated, because he was incapable of the kind of passionate love that Angelique was capable of recognizing as love. For example, Naomi’s parental love was passionate and she paid for it, while Joshua’s was cool – not to say cold. Interesting idea, that the effects of a curse are limited by the imaginative limitations of the person who fashions the curse. Episode 694. I think this will go down as my favorite episode. Love the last scene with Liz/Roger and the camera panning all the empty rooms of the mansion. The werewolf/Quentin story has been all I had hoped it would be. I know there are lots of good moments coming up in the first half of 1897, but I’ve really enjoyed the ride the past few months. I’m sorry this phase of the show is coming to an end. I enjoyed these episodes leading up to this. I thought it was cool how they brought Quentin in. Roger is just funny to me. Louis Edmonds was the best! I agree that this is truly one of the great DS episodes. However, it’s too bad that the limitation on the number of actors per episode was still in play for this one. We don’t see Maggie and Amy leave the house. There is no mention of Mrs. Johnson, Carolyn, or Julia. Wouldn’t it have been even more effective to see ALL of the residents abandon the house en masse? One thing I noticed when watching the end of this episode. The final montage of Collinwood rooms while Quentin’s theme plays, it reminds me of the ending of John Carpenter’s Halloween. Michael Myers’ theme is playing while you see different locations from the movie. I wonder if John Carpenter took inspiration from this? About boom mics (“Mic Shadows”): In the world’s puppet theater – I think particularly of Japanese puppet theater – it is often the case that the audience can see the see puppeteer plainly manipulating the puppets in the clear. Yet we overlook this, and just focus our attention on the puppets. I find myself skipping over notes about visible mics. I don’t notice them half the time – maybe more than half the time. My disbelief is suspended while I am watching the show. Not to say I don’t notice other glitches, but this one, not so much. Flubbed lines are something I notice, and we do expect characters in plays to speak more coherently than people do in real life. (For one thing, if characters spoke the way real people do, we would not understand them an awful lot of the time.) Still, I like the verisimilitude of calling someone by the wrong name, especially if the actor immediately corrects him or herself. My older brother’s name was Brian, and I vividly remember my father calling to me “Bri-Miles!” I am apt to cut the actors some slack for similar mistakes. 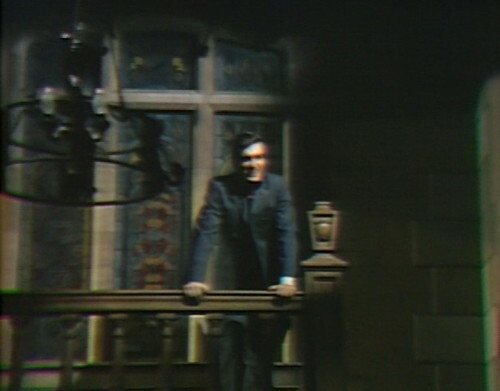 Professor Stokes is the closest thing to a moral center on “Dark Shadows.” I know that is a scary thought. I mean, Victoria was a goody-two-shoes and all, and Elizabeth is a reliably moral person and Mrs. Johnson thinks she is, but it is one thing to be “good” while walking through the world wearing blinders (that’s “blinkers” to any Brits who read this blog), and quite another to be as worldly as Professor Stokes is and still follow a moral code to any extent. Stokes has the morality of Sam Spade. It is a nice comparison because Spade says at the end of “The Maltese Falcon” that he cultivates the image of being more corrupt than he is. You can only cultivate that image by being a little bit shady. (Calling up your own personal mob doctor who will treat a gunshot wound and not report it.) But when it comes to bright lines between good and evil, Stokes always sees them and stays on the right side. He is my hero on the show. (It helps that he is also a disrupter, calling people on their BS and generally stirring up crap – yes, often not fixing things as he means to do, but poking a hornets nest instead. That is just fun for us and does not change the ultimately benevolent character of his intentions.